Offered for sale is a vintage and original 1940s art deco calendar print created for the Latin American pin-up market. 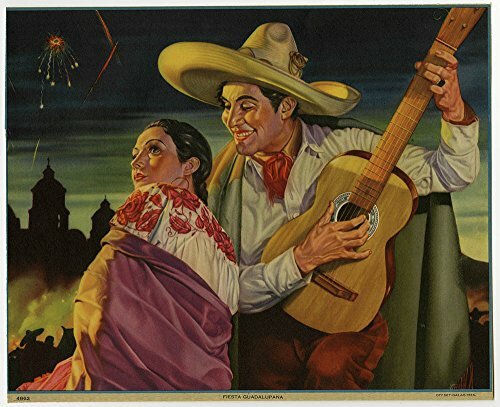 A lovely and vibrant lithograph, it features a romantic scene of courtship during the Fiesta Guadalupana. This night, December 12th, is one of the most important dates on the Mexican Calendar and thousands of people make the trip to the Basilica of Guadalupe in Mexico City to celebrate the Virgin of Guadalupe. Measures 10″ x 8,” printed in Mexico by the Galas company, one of the three leading calendar companies of the period.